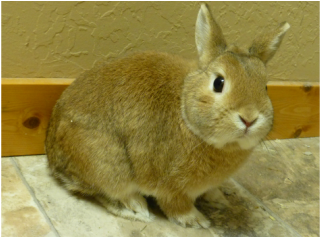 Cheeks - Animal Wonders Inc.
Hazel came to Animal Wonders in September 2017. He's a very handsome show quality rabbit that was lost for a month before returning to his owners. He's a little thin from his big adventure, but loves eating and is doing well. Hazel is still young, but he's not going to grow much bigger since he's a dwarf bunny. He's still a little shy, but the more he gets to know us the more curious he's becoming. Hazel has taken over the role of being an ambassador for rabbits, and he has big shoes to fill. Cheeks, the previous ambassador has retired from shows, but leaves an amazing legacy and Hazel is following in his footsteps. Cheeks came to Animal Wonders when he was still quite young. He's very social with humans and comes running when he sees you coming. He loves to be picked up and petted and he'll even give you licks on you arm. Cheeks has a few funny behaviors; he likes to flop onto his side and lay there, sometimes he will even lay on his back. Learn WHAT rabbits are, WHERE they came from, and HOW to take care of them in captivity.